At our latest NetIKX workshop we heard how Helen led her team at A.T.Kearney in developing an innovative series of podcasts, providing a new, more conversational way of knowledge transfer for staff and potential customers. A.T.Kearney is an international management consultancy with about 2,700 consultants. There are four staff in the global Knowledge team, which is headed up by Helen from London, with the rest of her team based in a couple of locations in the US. Typed documents are obviously one method of knowledge transfer, and still used within A.T.Kearney. However, in 2007 Helen and her then colleague Susan Montgomery (a founding member of the Aslib IRM Network, and its first chairperson), became increasingly aware that information also comes in audio or visual forms – phone calls, podcasts, pictures – and started to think about ways they could capture this alternative type of information through podcasting. At A.T.Kearney innovation and risk-taking is encouraged as part of the corporate culture. Helen’s Vice-President told her – “Go and do something. If you make a mistake, plead for forgiveness later!”. However, this doesn’t necessarily mean that big budgets are available for new projects, so Helen knew finding a very low-cost solution would be necessary to get the podcasts going. The Knowledge team put a business case together to produce an information podcast, detailing the number of working hours required, recording costs etc. They didn’t expect it to approved, but it was! The topic they chose for their first podcast was ‘Sourcing business travel’ – an important subject for big organisations. To keep costs extremely low, A.T.Kearney’s technical team were asked if they could help. They started by recording a conference call with a consultant at A.T.Kearney, which cost nothing. The technical team then edited it using free Apple software called ‘Garage Band‘. Copyright free music from the internet was used for background music, plus a copyright free image to advertise the podcast. It was “a really good feeling” for Helen and her team to have the first podcast done. They were encouraged to do more by enthusiastic colleagues and one of the team, Susan Montgomery, came up with the theme ‘Wave of the Future’ to name the series of podcasts. The aim is to give updates on the latest topics that matter to business leaders – including globalization, sustainability, and the latest trends in procurement – in a format that can be easily digested, for example, whilst commuting or travelling. The podcasts feature conversations with the staff at A.T.Kearney, giving them a platform to talk about a subject they know about, showcasing their knowledge and presenting them as experts in their field. Podcasts have also been produced on ‘Business information research’ and ‘Skeptical information seeking’, advertising the Knowledge team’s services. As the team have gained more experience in producing podcasts, they have put together guidelines for moderators and speakers. Set scripts are not used, but talking points are agreed beforehand. In the beginning the podcasts were put on iTunes, and have since been added to YouTube and the A.T.Kearney website. New starters at A.T.Kearney have begun using them to gain an understanding of the company’s expertise and culture. Key performance indicators (KPIs) as a measure of how well products are doing are used at A.T.Kearney, so being able to quantify the number of podcast downloads using Google Analytics has been useful. The podcasts are easily exceeding their current KPI of 1000 hits per month, averaging around 3000-4000 hits/month. To promote the podcasts, Helen tweets links to them and the Marketing team then re-tweets these, to promote her Twitter handle. No direct revenue has been produced yet, as the podcasts are free, but the team has started thinking about selling the podcast content as an e-book for a nominal price, to help reach a wider audience and potentially bring in some revenue. Helen concluded that “To innovate, you have to accept failure”. She didn’t know the series would be a success, and initially was embarrassed at the thought that they might fail, but went ahead and did it anyway. Helen replied that they do weed out old podcasts, for instance the first one the team produced on sourcing travel is no longer available online as it’s too out of date now. Helen thought around eight hours of planning, finding speakers etc and four hours of a technical person’s time. It can sometimes be quicker and sometimes longer, depending on how long it takes to organise the meetings with speakers and moderate the podcast. Not everyone has natural moderation skills, so it depends upon the person doing it. The A.T.Kearney podcasts are available on their website, iTunes and YouTube. 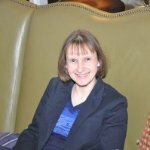 Val Skelton has written an excellent article on Helen’s talk for Information Today, ‘Podcast power – knowledge sharing through conversation’. Helen’s slides are now available in the Members section of the NetIKX website. 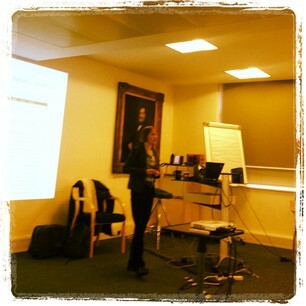 For those into tweets, see our Storify collection of the tweets from the seminar.